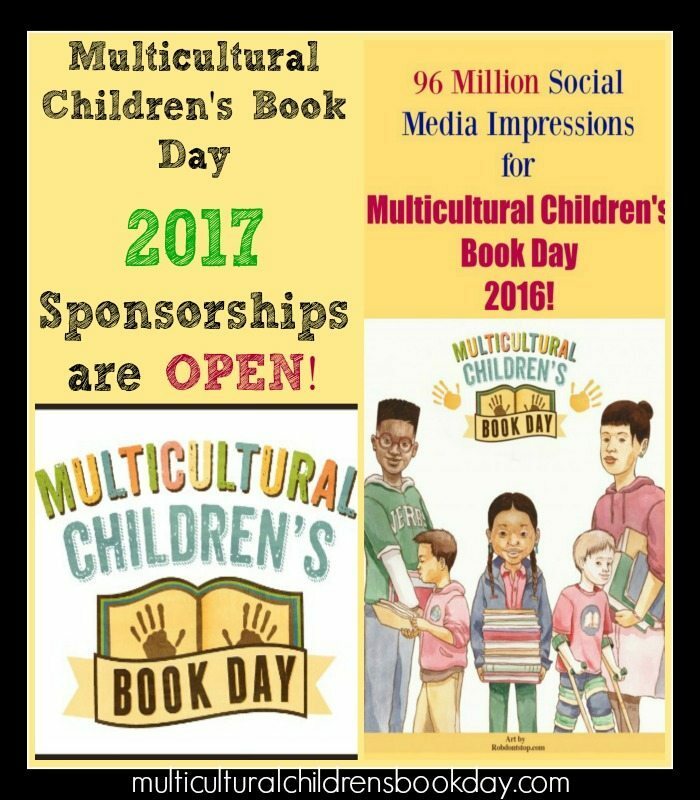 Today is the LAST DAY to tap into the powerful momentum of being a Sponsor for Multicultural Children’s Book Day 2017. This online holiday that takes place 1/27 every year (we are in our 4th year!) has grown bigger than I could have every imagine and every day I count my lucky stars that I teamed up with Mia Wenjen of Pragmaticmom to make this initiative a reality. Together, along with Head Elf and Project Manager, Becky Flansburg, we’ve worked tirelessly to raise awareness on the ongoing need to include kid’s books that celebrate diversity in home and school bookshelves. We’ve also continued to work diligently to get more of these types of books into the hands of young readers, parents, grandparents, caregivers, organizations, librarians and educators.This team effort takes shape in an online holiday that spans the globe, touches many lives and has a social reach in the millions. If you are an author or a publisher, this event is amazing way to reach your ideal audience; the kids, parents, grandparents, educator and librarians who are always on the hunt for quality children’s books that allows readers of all ethnic orgins, special needs and cultures to “see themselves” in the pages of a book. BUT, ALL Sponsorship levels will be CLOSING on January 6, 2017! Despite census data that shows 37% of the US population consists of people of color, only 10% of children’s books published have diversity content. Using the Multicultural Children’s Book Day holiday, the MCBD Team are on a mission to change all of that. This event has also proven to be an excellent way to compile a list of diverse children’s book titles and reviews for parents, grandparents, educators and librarians to use all year-long. If you know of someone interested in Sponsorship details, have them go HERE for the scoop. Don’t delay! All Sponsorship levels close 1/6/17! But, if this of interest to you or an author you know, don’t delay! The deadline for ALL Sponsorship levels January, 6, 2017. We want to allow plenty of time to share the details of our authors and sponsors before the big day on 1/27/17. Please go HERE to view extended details and benefits of all of our Sponsorship Levels including Author Sponsors. Being an Author Sponsor for this event gives books and authors visibility, traffic, social media support and an “in” with a vibrant readership and support system for a very affordable rate of $100. We also work very hard to match our author sponsors with book reviewers to give their work even more exposure. Currently we have over 350 children’s book reviewer who are standing by and ready to review books in January. And this year we aren’t limiting reviewers to bloggers only. Those moms and book lovers who have vibrant Facebook, YouTube and Instagram channels will be able to review books as well and share their reviews on these powerful social media channels. All book reviews will be compiled the day of the event in a huge Linky Party that doubles as a reading and book resource list for parents, teachers, caregivers and libraries. This linky will be present all year along on the MCBD site, on Jump Into a Book and PragmaticMom along will all 17 CoHosts’ sites.